Travel through the history of industry and solve the puzzles, whilst you see history come to life! The Time Twins and friends want to lead you on a tour of the past. Choose a character and join the team as you travel through decades and centuries, reliving the history of travel, industry and invention. If you’re a fan of picross games, you’re going to love Time Twins Mosaics. And if you’ve never tried one, there’s no time like the present! Use numeric clues to place multi-colored tiles into a grid and reveal a picture. You’ll start with some fun and easy puzzles in the early Industrial Era, but by the time you’ve reached the Space Age, you’ll be faced with big, multi-colored grids sure to test the wits of even the most seasoned puzzle-solver. This is no ordinary picross game, however, and the fun doesn’t stop with a single puzzle. The images you’ll uncover within each stage form parts of a larger depiction of the era in question. Finish the stage, and watch the scene you’ve assembled come to life before your eyes! 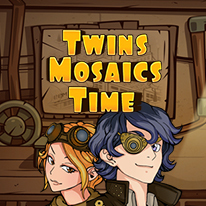 Time Twins Mosaics is both relaxing and challenging, and sometimes surprising! It features 100 levels across 20 different stages, each corresponding to a different period in modern history, from the days of coal and steam up through the dawn of space travel. - A colorful romp through time! - Join the Time Twins on their adventure! - Picross like you’ve never seen it! - A picross game for the ages! - Test your wits through time! - Relive history in this puzzle adventure!